Plates are shipped within the Continental United States only. International shipping is not available. Ader's black solid rubber bumper plates are equipped with a 2" stainless steel insert for easy sliding and a perfect fit on your Olympic bar. The distinct black finish with raised lettering gives them a bold look. The bumper plates are designed to fit a 2" Olympic bar. Central metal bushings protect the rubber from wear and tear, and makes the plates easier to slide onto the Olympic bar. 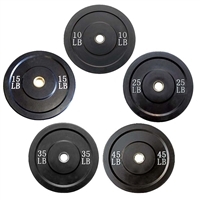 All of the bumper plates are the same diameter, which means the 10lb and 15lb plates are thin and prone to bending or to be broken. The rubber used to make the plates is not like a stiff plastic. The 260lb rubber bumper plate set should be used like sandwich type, put the 10lb and 15lb plates in the middle, so as the thin plates can be protected. If using the 10lb and 15lb plates alone, a 15lb training bar needs to be used instead of a 45lb Olympic bar, as thin plates capacity is only 15lbs. IMPORTANT- These plates are rubber, but are not meant to be thrown around. Consistent abuse may lead to cracks, or splits. Warranty does not cover neglect, misuse, or normal wear and tear. The warranty becomes void after the Olympic plates are transferred to a new owner.